Note: Not all Homebase subscription plans provide the option to control your smart home devices. 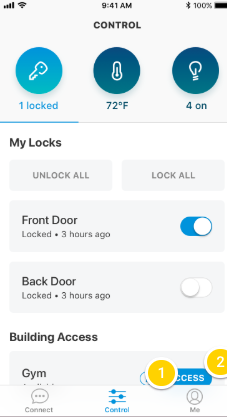 If this is something you would like, talk to your Property Manager via the Connect option in the Homebase Resident App or by calling using the instructions HERE. Navigate to the Controls view in the Homebase Resident App and select which type of device you want to interact with. Use heat or cool icons to set the mode for your thermostat then swipe temperatures to adjust where the thermostat should be set to. Select lock you would like to control. View the current lock status and choose to lock or unlock the device. Select the light you would like to control. View the current light status, choose to turn on or off the light and choose the color of the light (if available).